Here’s the story: a reverend and a rabbi start a blog. In 2008, Baptist minister Michael Smith and Jewish rabbi Rami M. Shapiro began a virtual conversation via blogspot.com. Called “Mount and Mountain,” the blog recorded a long-running dialogue between Mike and Rami in which the pair interpreted, argued about, and interrogated two key texts drawn from the canons of their respective religions: the Ten Commandments from the Torah, and the Sermon on the Mount from the Gospel of St. Matthew. 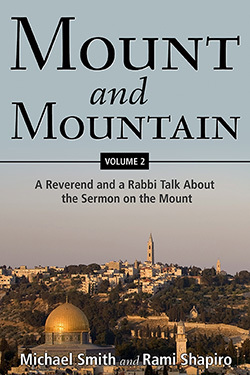 This book, focused on the Sermon on the Mount, represents the second half of Mike and Rami’s dialogue. In it, Mike and Rami explore the text of Jesus’ sermon cooperatively, contributing perspectives drawn from their lives and religious traditions and seeking moments of illumination. They are, like all of us, audience members, contemplating the words of Jesus together in the hope that we can discern Truth not only through revelation but also through conversation. As readers, we are a part of their conversation. We think and respond, we question and wonder, we entertain doubt and affirm faith. Reading their discussion, we are encouraged to begin our own. Reverend Michael Smith is a pastor, editor and writer. He serves as senior pastor of Central Baptist Church of Fountain City, Knoxville, Tennessee, and is a graduate of Belmont University (BA) and the Southern Baptist Theological Seminary (MDiv. ; PhD). He is active in Baptist life at the local, state, and national levels. He currently serves as a trustee of Belmont University and a member of the Consultation on the Common Text. Rabbi Rami Shapiro, PhD is adjunct professor of Religion at Middle Tennessee State University and the director of Wisdom House at Scarritt-Bennett, an interfaith center in Nashville. Author of more than twenty books, Rami also writes the regular column “Roadside Assistance for the Spiritual Traveler” for Spirituality & Health magazine. He can be reached via his website, rabbirami.com.ed via his website, rabbirami.com.